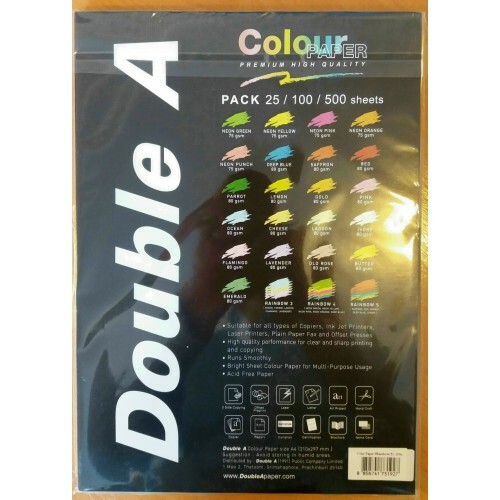 Premium quality colour paper Double A. Selection of colors - golden, ivory, pink, old rose pink, buttery yellow, emerald green, orange, red, green, blue, yellow, light blue, light yellow, light green, light pink, light violet (Gold, Ivory, Pink, Old Rose, Butter, Emerald, Saffron, Red , Parrot, Deep Blue, Lemon, Ocean, Cheese, Lagoon, Flamingo, Lavender). Package contains 500 sheets. Format A4, grams of 80 g/m2. High-quality, acid-free paper, suitable for laser and inkjet printers, copying, MFP-s, duplex printing, handicrafts, art. Produced in Thailand.